Bai Ji Guan—translated as “White Rooster Crest”— earns its name from the color and shape of its leaves. They’re rather yellow and crest-like. According to legend, an old rooster died near a place called Hui Yan Rock. The locals buried the bird under a tea bush, and the following year, the bush’s leaves grew in yellow. 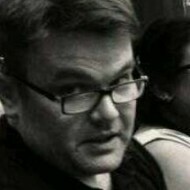 It’s as likely a story as any coming out of China. The only other time I’ve ran across tea bushes that grew in naturally gold or yellow were the mutant Yabukita bushes in Shizuoka, Japan. I would venture a guess that the case is similar here. They started off as one type of cultivar, and then this mutant strain came along. Since then, it was probably harvested for that particular trait, thus becoming its own cultivar—Bai Ji Guan. 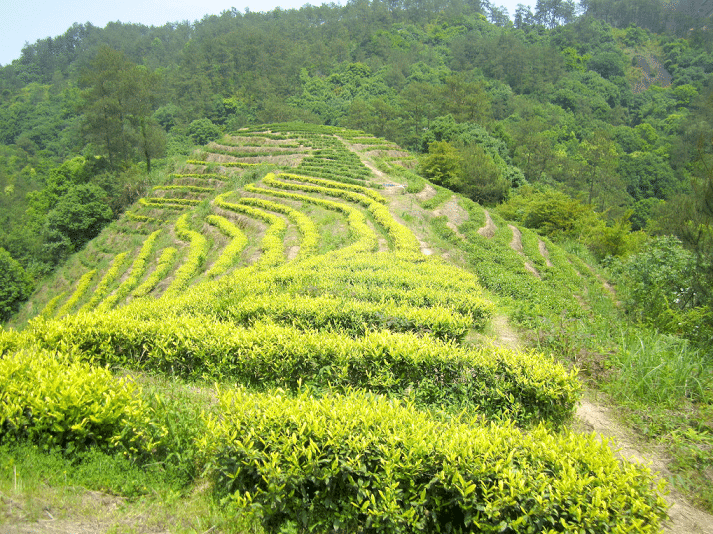 Yield of this type of tea is low, though, given the late harvest time, and the conditions required for it; when the leaves are at their yellowest. After being subjected to a light-to-mid roasting, the leaves turn out quite beautiful. 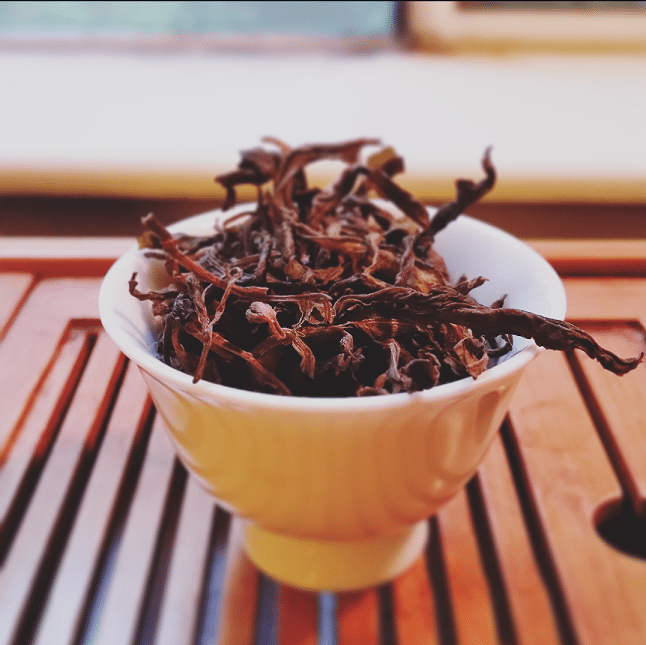 I really do like the look of some of these yancha leaves. Many are folded and processed rather wildly; whole leaf material intact. It gives the brewing affair a sort of untamed air. The leaves were char-brown to dark crimson, like kindling you’d find on a forest floor—only livelier. The aroma they gave off was pure candy. Burnt vanilla bean candy, that is. For brewing, I went with a standard gongfoolish approach—something that looked like a tablespoon of wide leaf in a 6oz. 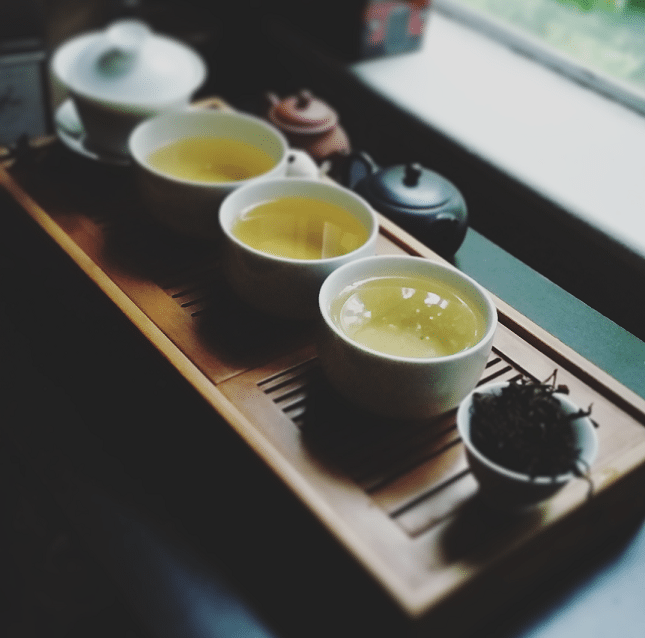 gaiwan, treated to three short steeps in boiled water. Was I overdoing it? Oh, who the hell cares? It was late. The first infusion (of I-don’t-give-a-flying-eff-how-many-seconds) brewed a very pale yellow and with an aroma of . . . herbs on fire. Well, not exactly on fire, but definitely shortly after a blaze. Not so much smoky as “roasted-over-a-spit”-ish; delicate yet meaty, does that make sense? I hope it does, ‘cause I’m just getting started. The second infusion was more light amber in color, and—for some reason—had a much sweeter aroma than the first. On taste, there was a deeper toastiness to the already-established burnt candy taste, and a bit of a caramel lean on the finish. The third steep started off with all of the above . . . then gave up and went all floral on me, which I liked! 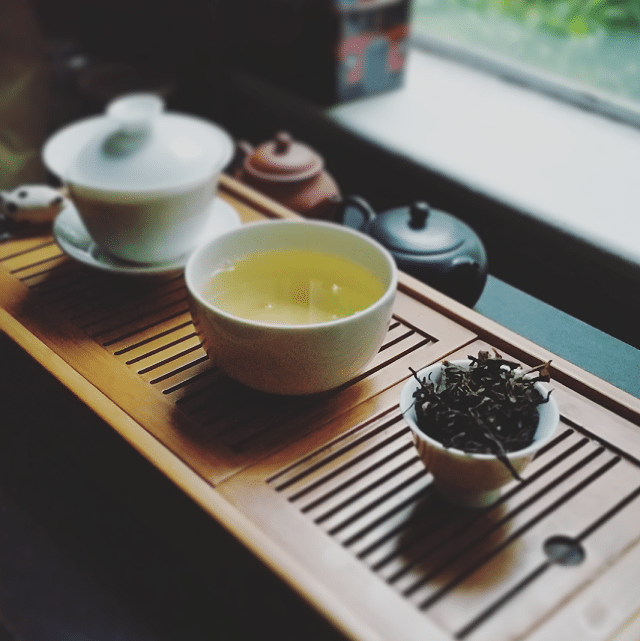 Wuyi oolongs still continue to impress and bewilder me. A bit of an aside, following this initial brewing session, I subjected my remaining sample to several travel mug brews on lunch breaks at work. Needless to say, those were the pleasantest lunch breaks ever. To buy this tea, go HERE. The only think that you did that was wrongish, was to imagine that you might something like that. It irritates me that people want to have rigid rules for making a tea like this. 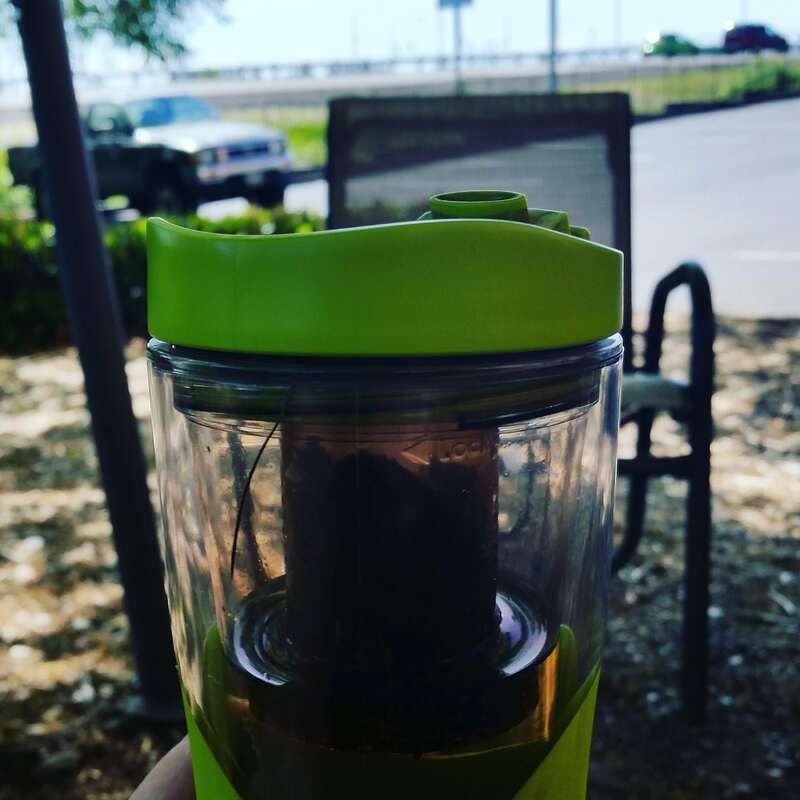 The other Chinese tea that has this bright yellowish green glow to it is Anji Bai Cha. I’m glad you find a mystery exists. That is what has always attracted me to great tea. The mystery is pretty much “my thing” these days. The cultivar of Bai Ji Guan is so special because this cultivar belongs to the family of albino cultivars.